Thank you. Two simple words, one powerful message. And because it is said that actions speak louder than words, you can emphasise your heartfelt thanks for any occasion with one of our unique personalised gifts or hampers that not only have the wow factor, but will definitely ensure that your message hits home! 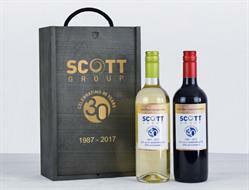 A brilliant corporate gift, or as a luxury hamper for family or friends, this Personalised Wine gift has space for a logo or image and your choice of text. Our Cabernet Sauvignon is a gorgeous tasting wine, perfect for all occasions and, dressed up with that individual touch it becomes an extra-special gift to celebrate a birthday,a retirement or simply to say thank you. Add an individual touch to your gift and send this Personalised Wine Gift to corporate clients or to family or friends. This Sauvignon Blanc is exceptionally well made, with apples and grass on the nose balanced with crisp, zesty acidity and a luscious clean finish. A perfect gift on it's own, or as part of one of our luxury gift hampers. 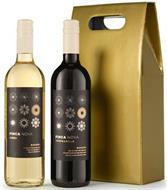 This personalised wine gift is a dry white wine, full of tropical flavour and featuring a rich golden yellow colour. With space on the label for a logo or image as well as personalised text, this personalised bottle of wine is perfect as a corporate gift. The Chocolate Lovers Gift hamper is filled with a selection of luxury velvet chocolates - a teddy bear (please note bear colours may vary please see images)! 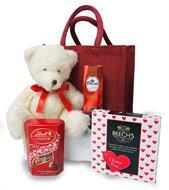 Show your love with this packed Red Jute Gift Bag that is perfect as a Mother's Day Hamper or a Valentine's Day Hamper. Chocolate is the food of love after all! A gift bag filled to the brim with scrumptious treats that the lucky recipient can enjoy, this Life's Little Luxuries Hamper is perfect as a birthday gift for her or even a Mother's Day treat! Whether it's to celebrate an anniversary, a birthday or Valentine's Day. or even just to say thank you to someone special, a Personalised Bottle of Prosecco from Highland Fayre is a fantastic way to add a personal touch to a lovely gift. The ideal corporate gift! Our Senora Rosa Cabernet Sauvignon is an elegant fruity wine, personalised with a bespoke label - add your own message, picture, or brand logo. For an extra special touch, we will engrave your wine label personalisation onto the wooden gift box lid as well. The XL Retro Sweets Bouquet is a whopping collection of retro sweets, filled to the brim with the best remembered sweets from your youth. With 31 Retro Sweets, this bouquet will not disappoint. All of our bouquets also have the option to add a gift message at the checkout, which will be placed in a coloured envelope and attached to the bouquet. Our Biscuit Sharing Bouquet is filled with a classic collection of snack size biscuits that are great for the entire family or office to enjoy. All beautifully arranged by our team of expert florists. All of our bouquets also have the option to add a gift message at the checkout, which will be placed in a coloured envelope and attached to the bouquet. Our cocktail hamper is the ideal gift for the gin lover in your life! This hamper contains two of Eden Mill's "Citrus Fizz Cocktails" - bright citrus flavours of grapefruit, lemon and blood orange, fizzed with Eden Mill's Original Gin. Oh and don't worry - because we have also provided some nibbles to enjoy alongside the cocktails! Treat your mum today with the Hugs for Mum Gift Hamper. Scented candles, a beautiful teddy bear and her favourite chocolates make this hamper one of our best sellers! Perfect as a Mother's Day gif, or just anytime you want to let your Mum know you are thinking of her. 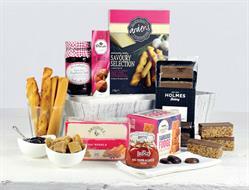 The perfect indulgent hamper for those with a sweet tooth! We have gathered the most decadent of treats in this hamper from intense chocolate truffles to luxury air popped caramel, chocolate and orange popcorn. Tuck in and enjoy! An indulgent after-dinner treat. The mellow Merlot is accompanied by Isle of Arran mature Cheddar, Epicure Pheasant pâté, Perthshire oatcakes and Dormen's cashews to create a gift that will be well and truly appreciated and very much enjoyed. 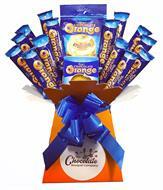 Our Terry's Chocolate Orange Bouquet is filled with tasty orange chocolate that smells fantastic from the second you open the wrapper. A great gift for all year round, and not just for Christmas! 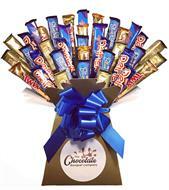 With 14 chocolate bars and a share pouch, this bouquet will not disappoint. All of our bouquets also have the option to add a gift message at the checkout, which will be placed in a coloured envelope and attached to the bouquet. 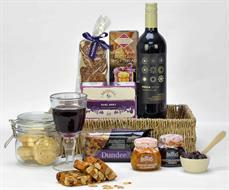 The Gift For Dad luxury hamper features real ale, nuts, pate and oatcakes, topped off with some toffees and chocolates, all presented in a blue wheatbraid basket. 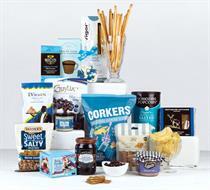 A great hamper to spoil your Dad on Father's Day - or any day! 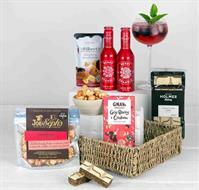 Our Hampers by Post range are a quick and easy gift for any occasion. This Gentlemen's Gift Box is filled with a selection of delights such as luxury Caramel Macchiato and whisky Popcorn and Dark Chocolate and Dark Ganache Orange flavoured chocolate. The perfect gentlemen's hamper! Everyone loves food, but if you're gluten intolerant it can be a little more tricky to find delicious treats. 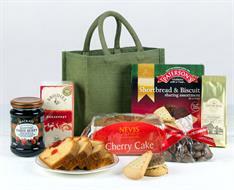 So here at Highland Fayre we offer speciality diet hampers such as this Gluten Free Gift Basket. 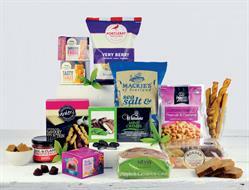 Filled with carefully selected and delicious gluten free sweet and savoury nibbles, it's a luxury gift hamper to delight the more intolerant among us! 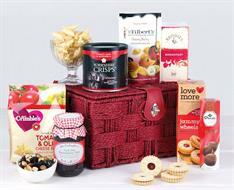 The Gift Basket Treat is a food hamper full of treats including cake, biscuits and chocolates. This gift hamper from Highland Fayre is fantastic and the treats are all perfect for enjoying over a cuppa. 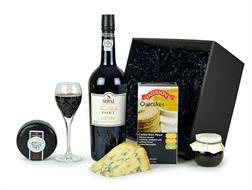 Celebrate in style with our Ruby Port & Stilton hamper. It's ideal as a corporate gift, or for that special after-dinner treat. 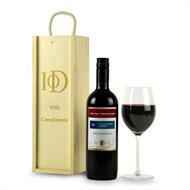 This personalised wine gift is the perfect choice to impress a client or thank your employees. We will laser engrave your wine label personalisation on to the wooden box as a little extra to help your company brand stand out against the crowd. Two bottles of craft beer from the award winning Eden Brewery in St Andrews are accompanied by some beer themed chocolates and savoury nibbles! A great gift for a beer connoisseur. 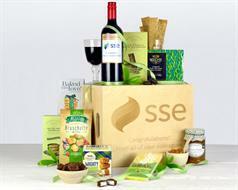 This luxury hamper is the perfect gift for a truly special celebration. A classic Merlot is accompanied with sweet and savoury treasures and is also presented in a stylish and contemporary crate which is ideal to be used for storage once all of the goodies have been devoured! 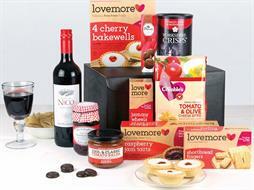 As the name suggests, our Family Favourites Gift Hamper is a real treat for all the family. This hamper contains a huge selection of old family favourites, and would be ideal as a corporate hamper for your staff too. 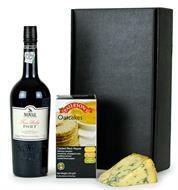 Celebrate in style with our Noval Ruby Port & Cheese hamper. It's ideal as a corporate gift, or for that special after-dinner treat. 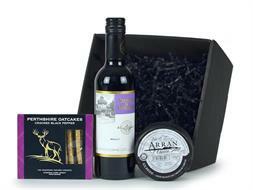 The Cheese Course Hamper makes a lovely gift to finish any meal. There is a bottle of Sauvingon Blanc, Scottish Cheddar, olives, chutney and oatcakes - and that's just a flavour of what makes this hamper a great gift for family, friends and colleagues. It can be hard to cater for a gluten-free diet, so Highland Fayre are here to help! This Gluten Free Gift Box contains specially selected gluten-free items and means that whoever you are giving it to, and whatever the occasion, everyone gets to enjoy a little bit of luxury. Wow your recipient with our personalised wine trio gift hamper. The black stained wooden box, allows the laser engraving to really stand out and gives a fantastic result along with the three personalised bottles of fine wine - we are sure you will have impressed them! Our Season's Greetings Christmas Gift Box is packed full of goodies from pâté and oatcakes to Christmas pudding and brandy butter. 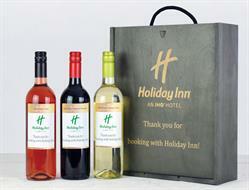 It makes an ideal gift for customers or staff to enjoy during the festive season. 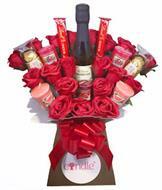 The Tantalising Treats hamper is the perfect gift for all occasions. Say thank you, wish happy birthday or say congrats with this special gift! The vintage style crate is filled with delicacies such as Madeira Cake from Royal Warrant Holders, Fisher and Donaldson, and Sea Salted Chocolate from the Artisan Coco Chocolatier. This Luxury Wine and Dine personalised hamper is full to bursting with a fine selection of all things savoury for that special gift. 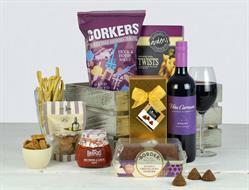 There's a wonderful selection savoury nibbles, biscuits and chocolate, complemented by a bottle ofpersonalised own label red wine. All this comes presented in a striking wooden gift box that can be personalised with a unique personal message that will last forever. Our Cheese Lovers Choice makes a stunning gift to delight any cheese afficionado. 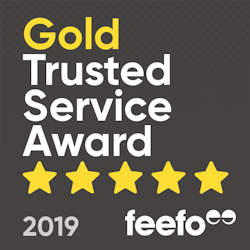 There are two cheeses - a Stilton and delicious Cheddar - presented alongside a selection of tasty nibbles and two bottles of fine wine which will certainly help wash it all down! One to impress your guests. If you have ever enjoyed a midnight feast then you will know how delicious everything tastes! Well this Midnight Feast Hamper certainly lives up to its name, offering loads of delectable goodies from cheese and chutney to cake and chocolates, and fine wines to wash it all down. Brought to you in a super seagrass basket that can be used for storage, this luxury gift hamper is ideal as a corporate gift for customers or staff, or to treat family and friends.